‘You ain’t dun nothin’ ’til you’ve Dunbogan’. | Sally says . . . eat, sleep, work, read, play, draw, bark . . .
← ‘I’m interested in everything but passionate about nothing.’ Jeanne Calment. ‘You ain’t dun nothin’ ’til you’ve Dunbogan’. On the other side of the river from North Haven where I live is the seaside village of Dunbogan—and the place to go for a great cup coffee with a view in Dunbogan is ‘The Boatshed‘. This is a sketch from a photo of the Boatshed. If I had wanted to draw the Boatshed from this angle any other way than from a photo I would have had to have been out in a tinnie on the river—and that was never going to happen. But I wanted to do some practice on perspective and this seemed like a bit of a challenge (which it was). Also note that there are no people in this sketch. 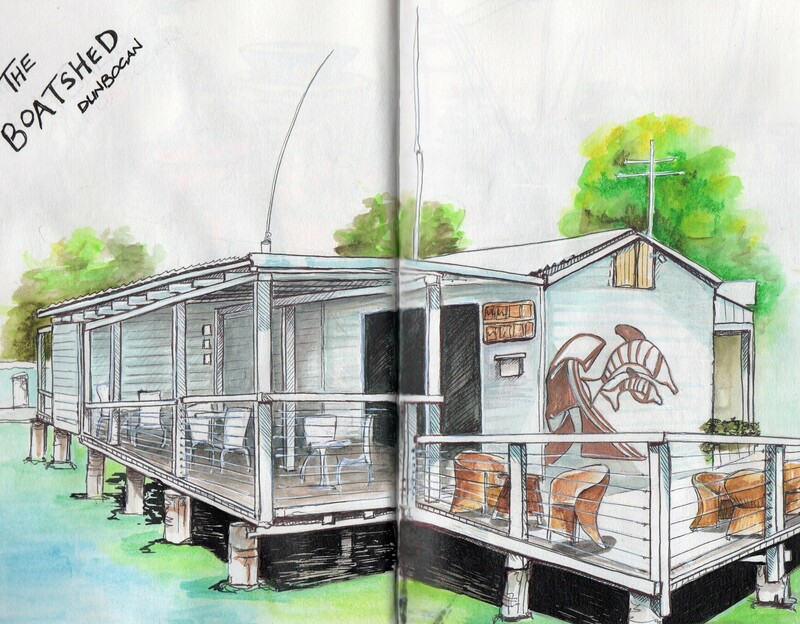 This is never the case at the Boatshed—it’s usually packed with people enjoying their coffee and cake and feeding the fish off the deck—but I haven’t quite got the hang of drawing people yet so I just pretended they weren’t there (a little thing called ‘artistic licence’.) One challenge at a time, methinks . . .
Love the sketch and love Dunbogan! It’s just outside of open hours Sal…I can almost smell the coffee though! I never knew you had this talent for drawing Skip!